Motorists and other road users are advised that asphalting work will start today. File photo. 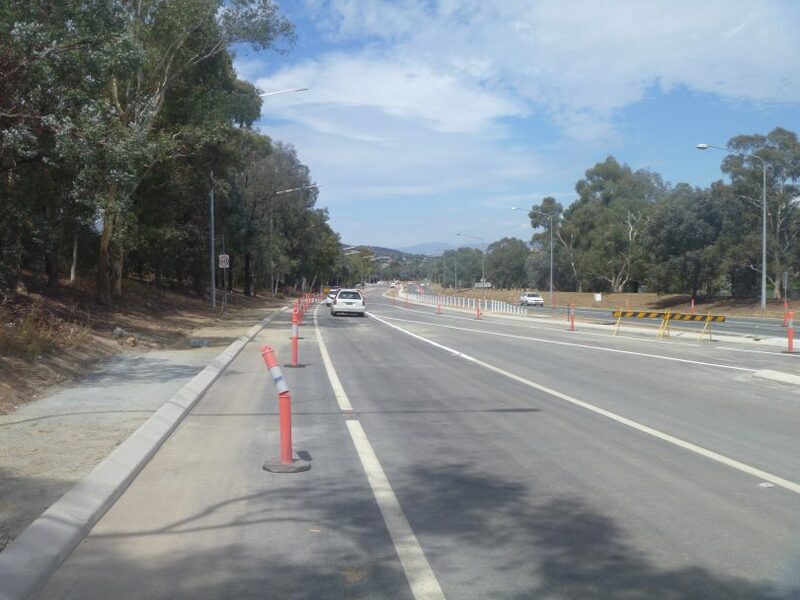 The ACT Government says all major construction work on Ashley Drive is now complete as both northbound and southbound lanes between Johnson Drive and Isabella Drive start to be resurfaced today (14 June). Asphalting work will be carried out on the existing lanes of Ashley Drive between 6 am and 6 pm from Thursday (14 June) to Tuesday (19 June) with only minor delays expected. After the resurfacing is complete, both duplicated lanes on southbound will be opened on Ashley Drive between Johnson Drive and Isabella Drive but the Government warns there may be further road maintenance on the existing lanes of Ashley Drive northbound between Johnson Drive and Erindale Drive in the coming weeks. Southbound lanes will be closed on Ashley Drive from Ellerston Avenue to Johnson Drive from 10 am to 3:30 pm on Thursday and Friday (14 – 15 June. There will be no right turn from Ellerston Avenue onto Ashley Drive southbound. Northbound lanes will be restricted to one lane from 7 am to 5 pm from Thursday to Saturday (14 June – 16 June). There will be restricted right turn access in and out of Clift Crescent from 9:30 am to 3:30 pm on Thursday (14 June), Friday (15 June) and Monday (18 June). Southbound lanes will be restricted by traffic controllers under stop and slow arrangement from Isabella Drive to Clift Crescent from 7 am to 5 pm on Monday and Tuesday (18 – 19 June). Barriers, as well as warning signs, will be erected to alert people to the closures. Traffic controllers will be on site to guide motorists through the area. The ACT Government thanks everyone for their patience while the work takes place. For more information on the duplication of Ashley Drive and other projects in the area, visit Transport Canberra and City Services or contact Access Canberra on 13 22 81. From long gone Labor MLA’s mooting that they will duplicate the busiest single lane road in Canberra before the 2004 ACT Election, to proposals for the road pasted up in Erindale shops in 2010, to Katy Gallagher saying that if she is re-elected in 2012 she will build it for completion in 2015, we might be almost there for the roadwork!!!!!! Maybe ironically, like Katy moving out of ACT Parliament and then out of the Senate, I have moved out of Tuggeranong. But I only have to think of the poor people trying to make those dangerous turns onto Ashley Dr from Gowrie, Monash or Richardson during peak hour or that it might encourage some better bus services through those areas without the driver having to navigate entering Ashley Drive in a slow moving vehicle.